. 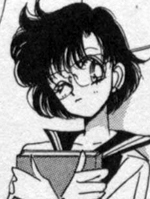 : Lunar Palace v.5 - Manga: Sailor Mercury :. Amy's parents are divorsed.Her mother is a doctor and her father is a painter. Her father taught her how to swim and play chess. He said they were good for keeping a level head.